Jole R. Shackelford. Philosophical Path for Paracelsian Medicine: The Ideas, Intellectual Context, and Influence of Petrus Severinus (1540-1602). Museum Tusculanum Press, 2004. The great Paracelsian scholar Walter Pagel and the pioneer medical historian Kurt Polycarp Sprengel identified Petrus Severinus’ Idea Medicinæ (1571) as an influential vehicle for the elaboration and diffusion of Paracelsian ideas in the late sixteenth and early seventeenth centuries, a process that has recently come under renewed scrutiny. Severinus’ conception that diseases grow from living, seed-like entities proved to be an especially important idea, which was recognized by prominent scientific and medical authors from Oswald Croll and Daniel Sennert to Pierre Gassendi and Robert Boyle. But they also formed a useful theoretical model for reconciling ideas about physical causation with certain Christian Platonist concerns in Protestant theology. 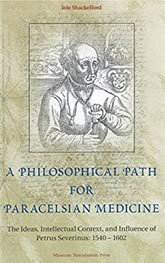 A Philosophical Path for Paracelsian Medicine is the first book-length monograph to treat Severinus, a Danish royal physician and contemporary of the great astronomer Tycho Brahe, and to present his ideas in their historical context as well as considering their ramifications for medical and religious theory in the decades prior to the Thirty Years’ War. This book will prove to be a useful tool in the reexamination of the process by which Paracelsian ideas were spread and assimilated and will appeal to all those interested the intellectual background for the work of Tycho Brahe and his students and the role of Paracelsian and Hermetic metaphysical ideas in the scientific revolution of the seventeenth century.